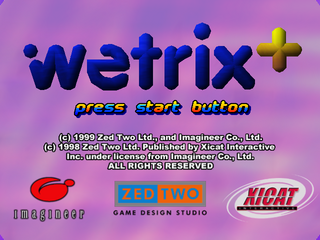 Wetrix+ is a Sega Dreamcast puzzle game which serves as an update to Wetrix, previously released on the Nintendo 64 and PC. Wetrix+ is a puzzle game based on water physics, where the objective is to score as many points as possible. Players are initially given a flat "landscape" - various shaped pieces fall from the top of the screen (similar to Tetris, but in 3D) which manipulate this landscape, usually by causing the ground to raise or be lowered. After a while, the game starts dropping water - the player then is tasked with containing the water in "lakes", trying to ensure that it does not drip off the side (or through holes) of the play area. Big points come in the form of fireballs which allow lakes of water to be evaporated. The bigger or deeper the lakes, the higher score.